Ryu, T., Veilleux, H.D., Donelson, J.M., Munday, P.L. and Ravasi, T. 2018. The epigenetic landscape of transgenerational acclimation to ocean warming. Nature Climate Change 8: 504-509. Writing as background for their study, Ryu et al. (2018) state that "acclimation through phenotypic plasticity may buffer populations against the impacts of rapid environmental change and provide time for genetic adaptation to catch up over the longer term." One form of such phenotypic plasticity is transgenerational acclimation, which occurs "when the environment experienced by parents alters the performance of offspring" so that they can cope with and adapt to the change. Hoping to better understand how transgenerational acclimation occurs, the five researchers set out to sequence the liver genome, methylomes and transcriptomes of the coral reef fish Acanthochromis polyacanthus in a cross-generational study. Their experiment involved exposing F1 generation offspring (from a control F0 parent) to a control, +1.5 or +3 °C warming treatment. This was followed by exposing F2 offspring from the F1 control treatment to a control or +3 °C warming treatment, as well as exposing F2 offspring from both F1 warming treatments (+1.5 and +3 °C) to a +3 °C temperature treatment. The treatments and their progressions across generations are illustrated in Figure 1. In discussing their findings, Ryu et al. report that sequencing revealed a total of "2,467 differentially methylated regions (DMRs) and 1,870 associated genes that respond to higher temperatures within and between generations." And of these genes, they say that "193 were significantly correlated to the transgenerationally acclimating phenotypic trait, aerobic scope, with functions in insulin response, energy homeostasis, mitochondrial activity, oxygen consumption and angiogenesis." The significance of the above observations, as expressed by the authors, is that they demonstrate that "exposure to higher temperatures associated with climate change causes genome-wide changes in DNA methylation, demonstrating that epigenetic regulation is possible in a coral reef fish facing a warming ocean, and that DNA methylation could play a role in transgenerational acclimation," which role is to "[restore] performance across generations in fish exposed to increased temperatures associated with climate change." Given such findings, it is becoming ever so clear that predictions of widespread animal extinctions due to global warming are unlikely to occur. Millions of years of evolution have given them the inherent ability to adapt to almost any environmental change they could realistically face. Figure 1. 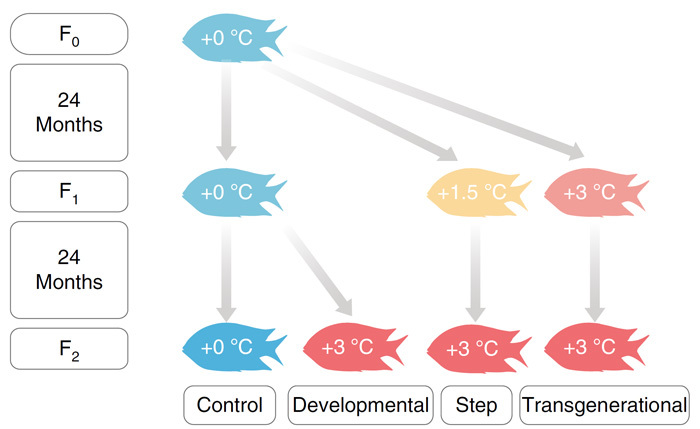 Schematic design of the different temperature treatments across generations in the fish-rearing experiment. Source: Ryu et al. (2018).